Immaculate Conception of Mary Heresy! of the Blessed Virgin Mary EXPOSED! According to Catholics, the Immaculate Conception, a solemnity, is the patronal feast of the United States. It is one of the few Holy days of obligation on the Catholic Church calendar (i.e., all Catholics are obligated to attend Mass on this day...December 8th). As this feast occurs early in Advent, it is a time for Catholics to consider Mary and her important role in the celebration of Christmas. In 1854, Pope Pius IX's solemn declaration, Ineffabilis Deus, clarified with finality the long-held belief of the Church that Mary was conceived free from original sin. In proclaiming the Immaculate Conception of Mary as a dogma of the Church, the pope expressed precisely and clearly that Mary was conceived free from the stain of original sin. This privilege of Mary derives from God's having chosen her as Mother of the Savior; thus she received the benefits of salvation in Christ from the very moment of her conception. 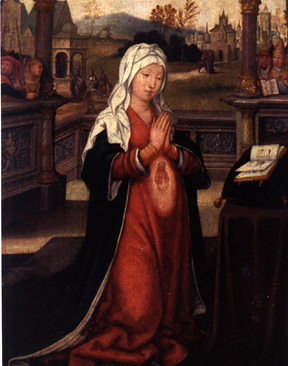 (The picture above shows her mother, Anna, with the infant Mary within her womb). This great gift to Mary, an ordinary human being just like us, was fitting (according to Catholicism) because she was destined to be Mother of God. Thus, Catholics believe that the purity and holiness of the Blessed Virgin Mary is a model for all Christians (Catholics). 490. To become the mother of the Savior, Mary "was enriched by God with gifts appropriate to such a role." The angel Gabriel at the moment of the annunciation salutes her as "full of grace." In fact, in order for Mary to be able to give the free assent of her faith to the announcement of her vocation, it was necessary that she be wholly borne by God's grace. 492. The "splendor of an entirely unique holiness" by which Mary is "enriched from the first instant of her conception" comes wholly from Christ: she is "redeemed, in a more exalted fashion, by reason of the merits of her Son." The Father blessed Mary more than any other created person "in Christ with every spiritual blessing in the heavenly places" and chose her "in Christ before the foundation of the world, to be holy and blameless before him in love." 493. The Fathers of the Eastern tradition call the Mother of God "the All-Holy" (Panagia) and celebrate her as "free from any stain of sin, as though fashioned by the Holy Spirit and formed as a new creature". By the grace of God Mary remained free of every personal sin her whole life long. For more on the role of Mary in Salvation History, read the entire section of the Catechism of the Catholic Church, §§ 456-511. What Does The Word of God Teach? The Bible teaches that even our good works are "filthy rags" in the sight of God. Why? Simply because God cannot be impressed with our self-righteousness. The whole reason why Jesus came to earth to atone for our sins is because we cannot save ourselves. How can a sinner make himself clean? How can a trapped man free himself? ONLY through Jesus Christ can anyone be saved and go to heaven. ONLY through Jesus can we have our sins forgiven. Salvation is all about getting your sins forgiven and having your name written in heaven in the Lamb's book of life. No amount of religion or personal effort can merit a person heaven. We must rest in the finished work of Christ's atonement by trusting upon the Lord. We must believe upon the Lord Jesus Christ (Acts 16:31). Again, there is NOT one Scripture in the entire Bible which even hints to such nonsense as the "immaculate conception of Mary." Mary was born with a sin-nature just like any other fallen human. ONLY the Lord Jesus Christ was born without a sin-nature. This is because Jesus did NOT have an earthly father, but God in heaven was His Father. Jesus had God's blood flowing in His veins, not man's (Acts 20:28). Jesus had Adam's flesh, but not Adam's sin-tainted blood. The Life is in the blood (Leviticus 17:11). It's the father's blood type that is carried to the child, not the mother's. Mary was simply an instrument used for God's glory and purpose. There was NO sexual relations between Mary and God (contrary to the wicked lies of the perverted Mormon religion). The Scriptures are clear that ALL humans are sinners. ONLY the virgin born Son of God, Jesus Christ, was without sin. Please don't believe the damnable heresies of Roman Catholicism. Mary was a sinner deserving of hell, as are ALL sinners (Romans 6:23; Revelation 20:15; 21:8). The "Blessed Virgin Mary" did NOT remain a virgin. Joseph had intimate relations with Mary after Jesus was born. Joseph was her husband, what else would you expect? John's gospel records a fulfilled prophesy from the book of Psalms--in it, Jesus tells us He has brothers and sisters. Why was He an alien to His mother's children? Jesus' brothers did not believe in Him. The apostle Paul saw the Lord Jesus' half-brother James. The Catholic religion says the word translated "brother" should be "cousin". Wrong again. The word "cousin" is clearly found in the scripture and it means--you've got it--cousin! The Catholic teaching that Mary was a perpetual virgin is utter nonsense in light of the Scriptures we have just observed. Mary and Joseph were married and bore several children together. In Luke 2:41-49, we read about Joseph and Mary searching for Jesus when He was twelve. It's obvious from these Scriptures that Joseph and Mary were still together as husband and wife twelve years later. Do you really think Joseph and Mary lived together without being intimate? The Vatican would lead us to believe so. The entire Catholic religion crumbles to naught in the plain light of God's Inspired Word. How ridiculous that the Catholics have idolized Mary even to the point of making her Christ's co redeemer? Where does this infatuation with Mary end? Unbelievably, during one rosary prayer (a chaplet), a Catholic will pray 53 hail Marys! (as seen below). Each "hail Mary" prayer is 42 words long. 42 x 53 = 2,226 words just praising Mary! The devout Catholic who prays the rosary every day will praise Mary with 812,490 words in a year's time. That is idolatry! Though someone might contend that half of the hail Mary prayer is a Bible verse, it surely has been taken way out of context. Jesus NEVER taught us to recognize Mary in any way. God NEVER asked us to recognize Mary in any way. Mary didn't even exist in the Old testament, but the Babylonian false god, the "Queen of Heaven," existed (Jeremiah 7:18;44:17-19,25). Catholics even refer to Mary as the "Queen of Heaven." In fact, they do it continually in their prayers. The Roman Catholic's fictitious Mary is the Great Whore of Revelation, NOT Jesus' mother. Jesus' mother was a sinner who needed to have her sins forgiven by believing upon Christ, just like everyone else does. Roman Catholicism teaches LIES, despicable lies of the devil. It's hard to imagine over 1,000,000,000 Catholics in the world who blindly follow the Catholic religion, totally disregarding the plain and clear teachings of God's Word. The problem is that Catholics are taught by the Vatican that the Catholic Church is "infallible" in addition to the Bible. Catholics are sinfully taught that the Vatican knows best. I heard a priest tell his congregation to "listen to the Pope" to be safe on all matters of morality and faith. No Sir!, you listen to the Word of God! The Catholic religion is composed of pagan religions and manmade traditions. Read more on Catholic traditions. Don't you see friend, you have been deceived by the devil. Here is a list of Catholic heresies and the years they were invented. As you can see, the "Immaculate Conception" of Mary heresy wasn't officially recognized by the Catholic Church until 1834 when Pope Pius IX made it so. How can you just make up doctrines as you go? It's just a big game to the Vatican. It was in 1950 that Pope Pius XII decided to recognize the Assumption of Mary, a ridiculous Catholic teaching no where found in God's Word. Wake up folks!!! Roman Catholicism as well as Russian Orthodox Catholicism is straight out of the pits of hell. I do not say this to be unkind, but to proclaim the eternal truths of God's Word. The Immaculate Conception of Mary is a hoax, NOT based upon Biblical doctrines. I beseech you to consider your ways and turn away from false religion, and TO the precious Lord Jesus Christ Who died upon the cross to pay for your sins and mine. It doesn't take a mountain of faith to be saved, just enough faith to call upon the Lord to forgive your sins and save you. If you would like to know how to be born again from the Bible, then click below. May God bless you. The Immaculate Deception of Mary!